Glögi is the Finnish version of mulled wine, popular through the winter months and essential at Christmas. 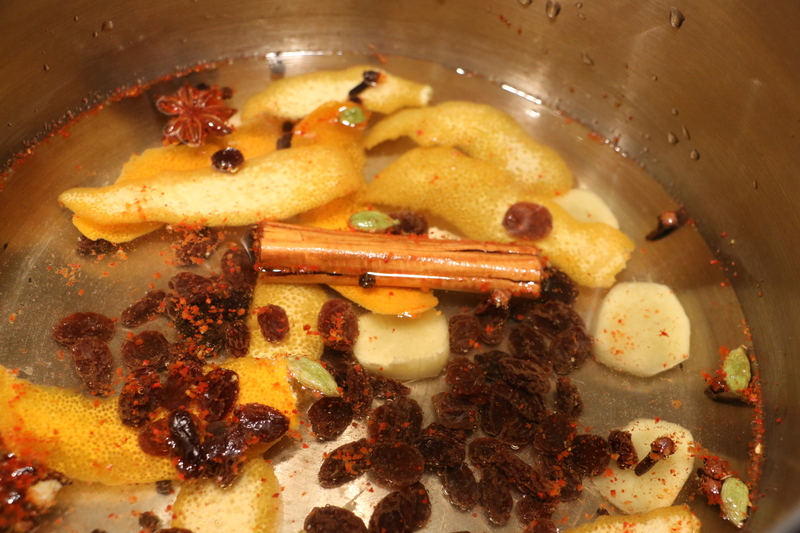 Although one can readily buy various preparations from which glögi can be made, it is easy enough to make at home. The essential ingredients are cloves, cinnamon sticks, citrus peel, a little sugar to sweeten to taste, and, of course, a reasonable bottle of red wine. Mulled wine should not be made with nasty wine – if it is not good to drink as it stands, then it will not make good mulled wine. 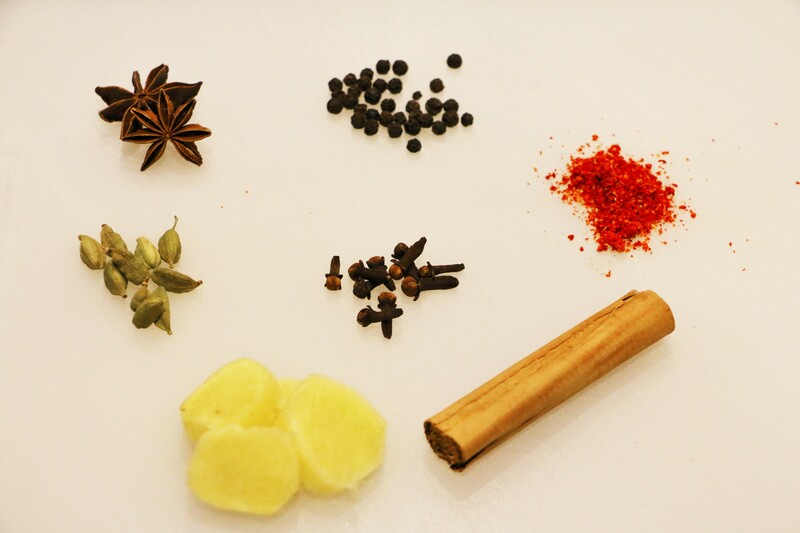 Over the years I have added and removed various spices from my recipe, and often make it up from whatever takes my fancy. I often add a little fresh ginger if I have it to hand, star anise, which is a really good addition, a few peppercorns, cardamom pods, and just a pinch or two of chilli for a little warmth. However, it really does work fine with just cloves and cinnamon, the way I learnt to make it from mother-in-law Riitta. For the citrus, the peel of one large orange, per bottle or wine, is ideal. This should be removed with care – using, for example, a vegetable peeler – so that only the zest is taken. Adding the pith will make the mulled wine bitter. More often, I use the zest from a couple of satsumas, as we have bags of these during their season and especially around Christmas. To extract the flavour from the spices and citrus I simmer them in water for 15 minutes or so, before adding the sugar and the wine. 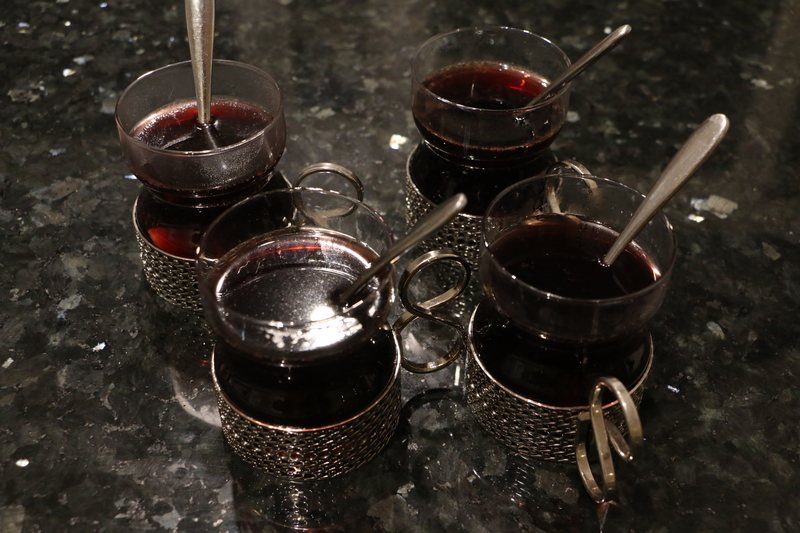 The glögi can be prepared ahead of time and will happily sit there infusing until one is ready to warm it and serve. When the wine is added it should be warmed gently and not allowed to boil. To serve in the Finnish style, a few blanched whole almonds and a spoonful of raisins are added to each glass. Remove the zest from the orange or other citrus and place in a saucepan. Add the spices, raisins, and the water. Simmer for 15 minutes or so, making sure not to let the pan boil dry. Add the sugar, to taste, and stir to dissolve. Add the red wine and leave to stand until ready to serve. Add a few raisins and almonds to each serving glass or cup. Warm the wine and strain into a jug for pouring or carefully ladle into the cups.